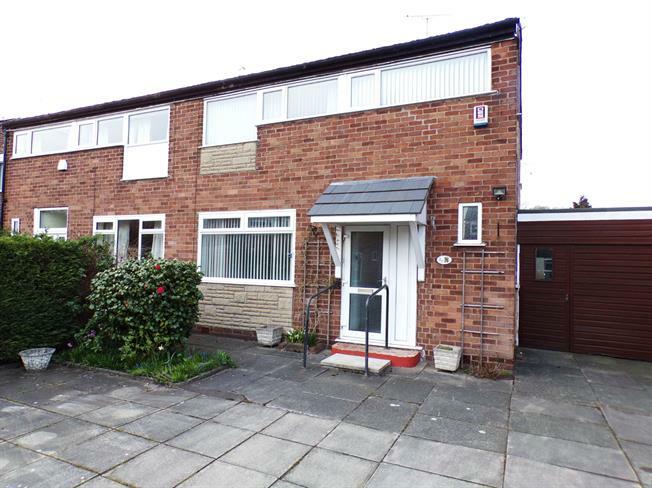 3 Bedroom Semi Detached House For Sale in Liverpool for Asking Price £180,000. Located in a cul-de-sac within easy reach of local school and amenities Entwistle Green are pleased to advertise this three bedroom semi detached house. The property briefly comprises to the ground floor, entrance porch, hallway, lounge, living room and kitchen. To the first floor there are three bedrooms, shower room and separate W'C. To the outside there is the driveway for multiple vehicle parking with access to garage and private rear garden. The property further benefits from double glazed windows and electric storage heaters making this a great family home or investment. Hardwood single glazed door, double glazed uPVC window to side aspect, electric storage heater, carpeted flooring, built-in storage cupboard, painted plaster ceiling with ceiling light and stairs leading to first floor. Double glazed uPVC window to front aspect, carpeted flooring, television point and painted plaster ceiling with ceiling light. UPVC French double glazed doors leading to conservatory, gas fire with feature surround, carpeted flooring and painted plaster ceiling with ceiling light. Hardwood French single glazed doors leading to rear garden, single glazed hardwood windows and carpeted flooring. UPVC side double glazed door leading to garage, double glazed uPVC window to rear aspect, electric heater, tiled flooring, roll top work surface, wall and base units, stainless steel sink, space for gas and hob and space for washing machine and fridge/freezer. Double glazed uPVC window with frosted glass to side aspect, electric storage heater, carpeted flooring, painted plaster ceiling with ceiling light and stairs leading from ground floor. Double glazed uPVC window to front aspect, carpeted flooring, fitted wardrobes and painted plaster ceiling with ceiling light. Double glazed uPVC windows to front and side aspects, carpeted flooring and painted plaster ceiling with ceiling light. Double glazed uPVC window with frosted glass to side aspect, carpeted flooring, tiled walls and low level WC. Double glazed uPVC window with frosted glass to rear aspect, carpeted flooring, tiled walls, painted plaster ceiling with ceiling light, double shower cubicle with electric shower and pedestal sink. UPVC back double glazed door leading to rear garden, double glazed uPVC window with frost glass and single wooden door to front. Driveway for multiple vehicle parking and opening to street. Lawned area to borders with shrubs and plants, patio area and green house.